Riding boots are the best shoes for any kind of riding. From equestrian training to motorcycle riding, you always find yourself wearing a pair of good boots. Finding great riding boots can be a struggle as sometimes the fit and features don’t come together. We sat down to research and review riding boots so you can ride away into the sunset without spending hours looking for them yourself. Before we give you our list of favorite riding boots, we came across a few features that we think you will be interested in. These features determine the functionality, look, and fit which are all very important to look at before taking out your wallet. Here are six of the features we believe will make your buying life easier. Gender: If a boot looks boyish or girly, it might not matter to you, but the gender has more to do with sizing than you think. Many women find this out when they try on men’s boots for the first time. There’s quite a difference. 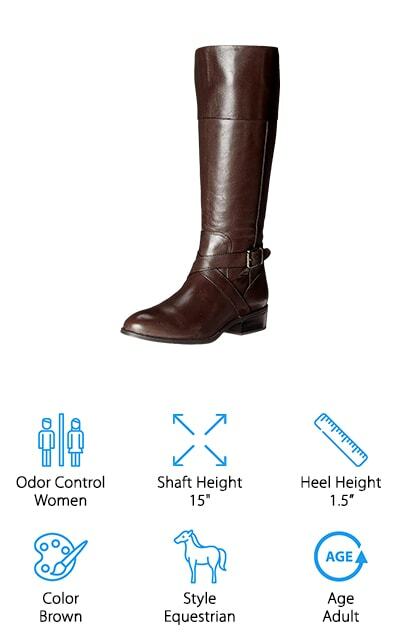 Shaft Height: The shaft height is how far your boot goes up your leg. Measure this from the bottom of the sole to the very tip top. 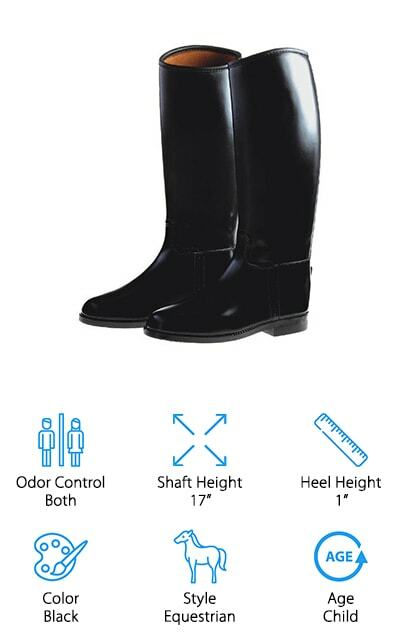 Shaft height can be a problem if you buy extremely high boots as they may be too tight or too loose. 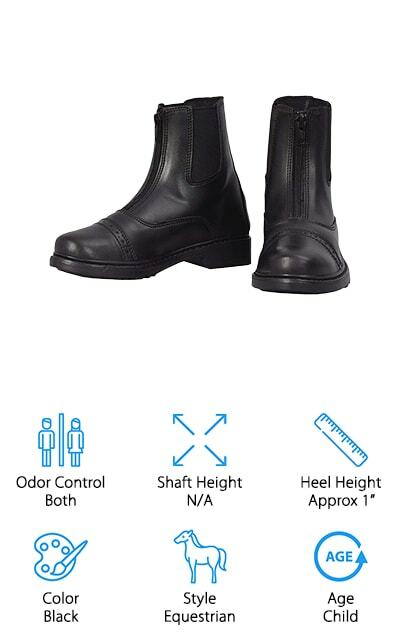 Heel Height: The heel height is how tall the heel is from the bottom of the sole to the start of the boot shaft. Heel height is more of a personal preference, but most equestrian style boots are relatively flat on the bottom. Color: Two of the most common colored boots are black and brown as they blend in with almost any outfit and don’t stand out. Color can be a determining factor at checkout, so be sure that you are buying the color you want as brown and black often look the same. Style: Boots can be used for a variety of reasons, but riding boots are often used for riding motorcycles or equestrian competitions. Find a style that fits your hobby or try a new boot and see how it goes! 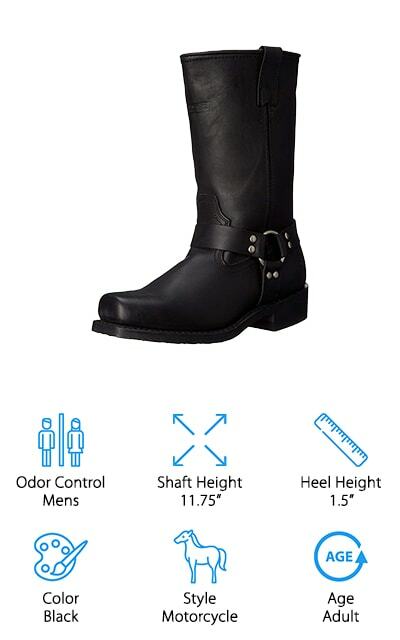 Age: If you’re looking for boots for the whole family, be sure to peruse the age section. Like gender, the age specifications can be helpful in determining your size. You would hate to have a pair of boots come home and be perfect for the movie Honey! I’ve Shrunk the Kids. It’s time to get to the good stuff! We gathered our Top 10 riding boots into one complete buying guide to give you exactly what you need to know right at your fingertips. Our top pick and budget pick represent our very favorite riding boots, but we’ve also selected a few other great choices for you to choose from if you don’t find they fit your fancy. Are you ready to ride? If you’re looking for tall riding boots, Ralph Lauren’s Maryann Boot is the perfect equestrian style boot option. The shaft height from the arch is 15 inches, so you’ll be covered from calf to knee. These boots come in three colors: brown, black, and brown & black. The criss-cross buckle strap is a great, subtle detail for women who like something more than just a simple boot. The zipper can be found on the inside leg of the boots, so you won’t be able to see them unless you sit down to take them off at the end of a long day. They are made of leather so be sure to take care of them as they might not be a great boot for snowy or water related activities. The Ralph Lauren Maryann Boot has all the class and luxury of the brand and all the functionality of an equestrian style boot. Pick up a pair to see for yourself! The TuffRider Equestrian Riding Boots are the perfect horse riding boots for beginners. These boots are made with a PVC sole, so you won’t have to worry about replacing them anytime soon. The leather is synthetic, too, so these boots will last your children a lifetime. The zipper is in the front for easy take on and take off, but you won’t be able to tell from afar as the zipper blends in nicely with the boot itself. There are elastic gussets on the top portion of the shoe to make getting your child’s foot inside the boot without struggle. You have two colors to choose from: black and mocha. These boots only come in children’s sizes 5-8, so be sure that your child’s foot size is in this range before purchasing. After every muddy equestrian ride, be sure to take a damp cloth to clean them before storing them away. If you’re looking for a great riding boot for your child, the TuffRider Equestrian Riding Boot is one of our favorites! Sam Edelman’s Riding Boots give you a ton of options for equestrian riding boots. 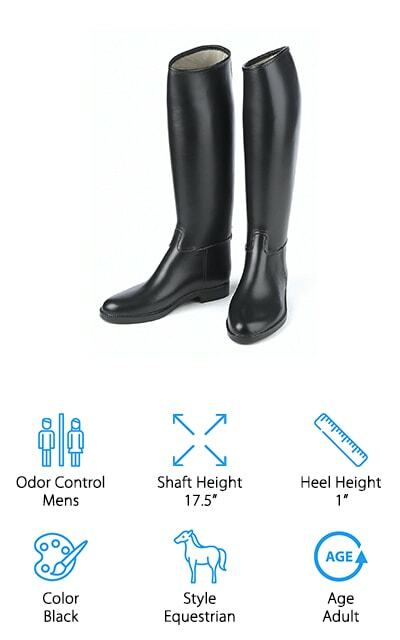 These boots are tall, reigning in at 17.5 inches, so be sure to measure your leg before buying these boots to avoid an awkward fit. These boots come in 7 colors, including colors like Whiskey, Brown, Black, and Olive. The burnished leather and distressed coin buttons give these boots a vintage look that we all love. If you have wide feet, you’ll love these boots as they give your foot plenty of room to breathe in a comfortable boot. The boot opening is 16 inches wide, so be aware of that when measuring your legs to avoid gaps between your calves and the boot. Whether you’re riding a horse or hanging out with friends the Sam Edelman Riding Boot is great for any activity. With plenty of colors to choose from, this boot gives you the diversity and comfort you need for whatever you do! The Adtec Harness Motorcycle Boot is our first men’s boot on the list. These boots are much shorter than the equestrian style boot, but they offer a ruggedness that the equestrian boots can’t match. Made from imported, full-grain leather, these boots are hardy for any adventure you plan to take on your bike. The synthetic sole gives you plenty of traction and won’t deform next to the heat of your engine. The soles are also oil resistant and slick proof, in case you come across any wet roads on your journey. When you order, many suggest ordering a size down from your normal size to get the right fit. Those that have these boots say they fit like a glove and give other brand name motorcycle boots a run for their money! The bottom line is: if you’re wanting a motorcycle that takes care of business and looks great the AdTech Harness Motorcycle Boots are the pair for you! These boots are made by Harley-Davidson. Many consider this brand to sell the best motorcycle riding boots of all time, so we had to add this pair to the list. Harley-Davidson’s Riddick Boot is a leather boot with all the details you expect including a zipper and lace up shoe strings. These boots give you the “bad boy” feeling and look great on your feet. The classic Harley-Davidson symbol is emblazoned on the side of each boot to give you the look and feel of a true biker. The shaft height rises to about 8 inches, giving you plenty of coverage from the sole of your feet to your ankles. The zippers can be used for ventilation when long days on the bike turn into hot days. You’ll find that these boots fit wide feet, so you might consider buying a size down to get the perfect fit. If you’re a Harley-Davidson fanatic or just love a great motorcycle boot, the Riddick Boot is tough enough to take on any adventure! For the kid who loves motocross or motorcycles, Fox Racing has developed a boot to make them feel like a true rider. Both boys and girls can find a pair to work for them as there are a variety of colors including black and pink. Made with full-grain leather, these boots are abrasion resistant when the riding gets rough. These boots are also flexible enough to form to your child’s feet like gloves. Instead of lace up boots, Fox Racing made it easy for children with two simple buckles to take the boots on and off easily. The suede leather inside protects your child from heat and abrasion for less injury and more time on the bike. 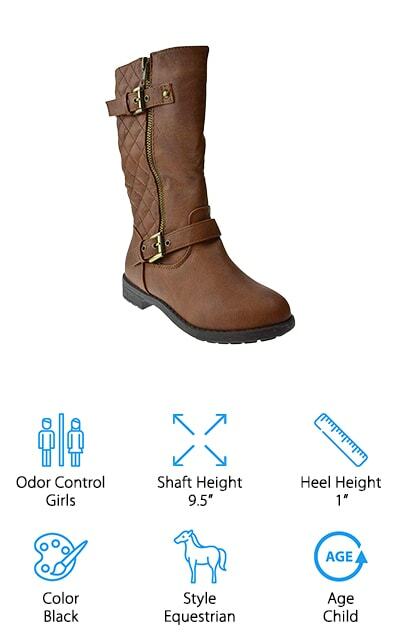 These boots come in sizes 10-13 so be sure to check the sizing guide to ensure a perfect fit. 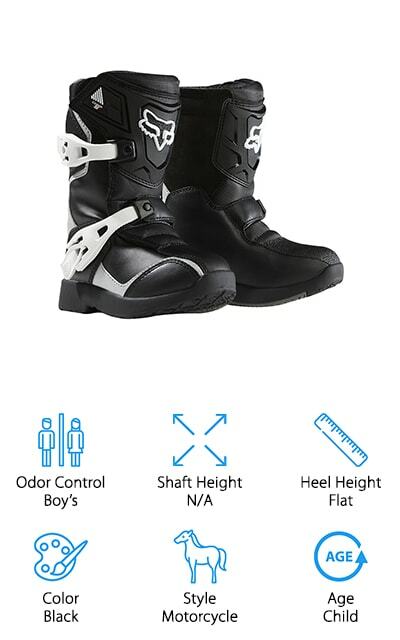 If you have a wild child, the Fox Racing Pee Wee Motorcycle Boots are perfect for days spent out on the track! The Lucky Top Riding Boots are the perfect style for any little girl who loves riding horses! Made from synthetic leather, these boots will hold up to the test of time. You have 5 colors to choose from, including black, brown, and even white, to match with any equestrian outfit. 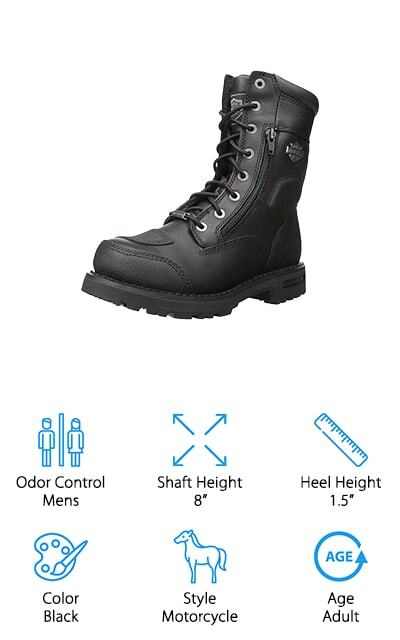 These boots are meant for outdoor use, but be cautious wearing these out in the snow or rain. If you do need to wash them, be gentle and shake off as much excess dirt before wiping down with a damp cloth. You’ll find two buckles on the sides that give your daughter the option to tighten around the ankle point and calf area. The height of these boots is around 9.5 inches, so they should fall right under the knee for flexibility and full range of movement. The Lucky Top Riding Boots are a great starting pair of equestrian style boots for the little horse lover in your life. Grab a pair and hit the stables together for happy smiles on everyone’s faces! 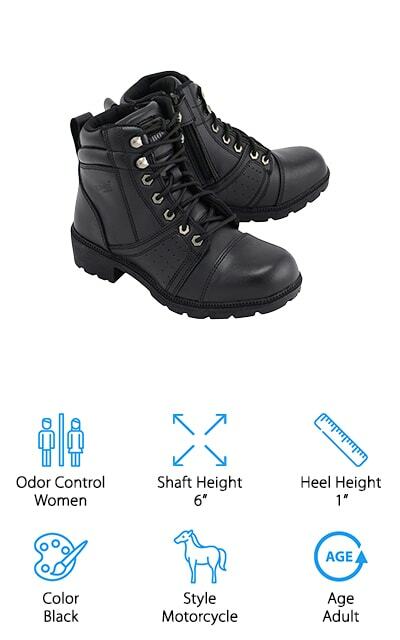 For all the female motorcyclists out there, the M-Boss Apparel Motorcycle Boots are a hit! These boots have all the bells and whistles of classic motorcycle boots without feeling too clunky or heavy. They are comfortable enough to wear all day, but it gets even better! These boots are made with 1.8mm thick full-grain leather making them acid and oil resistant. The laces and zippers make these boots easy to take on and off after a long day on the road. No worries if your feet tend to sweat on hot riding days either. These boots are made with moisture wicking and antimicrobial insoles to keep the sweat and bacteria out and away. You won’t have to worry about leaving a skid or mark behind you either, because these boots are anti-mark and anti-skid, too. Ladies, if you’re looking for a sturdy and fashionable pair of motorcycle boots, M-Boss Apparel has the perfect boots for you! Much like the Ovation Derby Riding Boot, the Dublin Kids Universal Boots are made in a traditional equestrian style. They are completely waterproof and easy to slip on and off. These boots are very tall, so determining the right size before buying is a must. The lining inside the boots is made with moisture wicking material, making them breathable for any day on your horse or in the stables. The outside is made of rubber, so they’re easy to clean with a simple wash or damp cloth. Even though these boots are made for riding, they also can function as rain boots or cleaning boots for dirty jobs. There are also spur rests on the heels of these boots to keep your spurs nice and secure while riding. The Dublin Kids Universal Boots are truly universal. They can be used for riding, cleaning, or walking in the rain. If your child enjoys getting dirty, try these boots out and see for yourself!